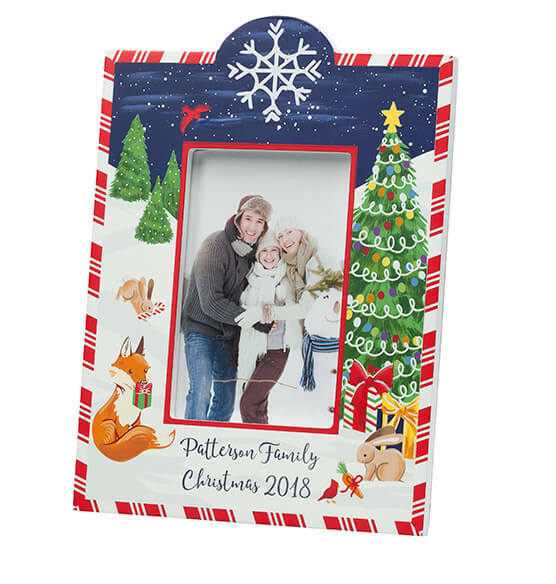 Each year PersonalizedThings by Exposures offers a unique collectible holiday photo frame. 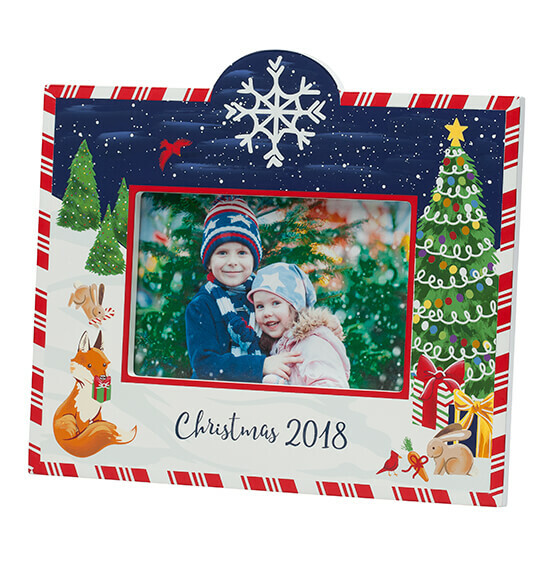 The 2018 collector's Personalized Winter Frolic Christmas Frame adds a fun pop of holiday cheer to any dècor. 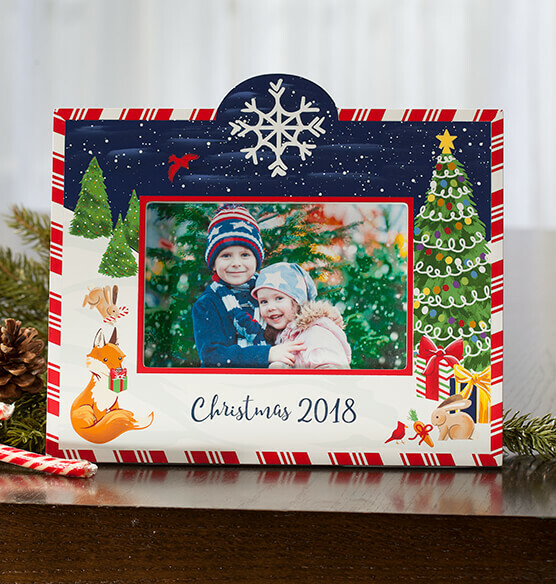 Hand painted details include a colorful Christmas tree with wrapped presents at its base, plain pine trees, red cardinals and cute forest animals. At the top, a giant snowflake falls from the night sky. A red and white striped candy cane border and a plain red border add bold color. Overall, the arched cutout, furry friends and decorative tree create a beautiful display for any one of your favorite seasonal photographs. 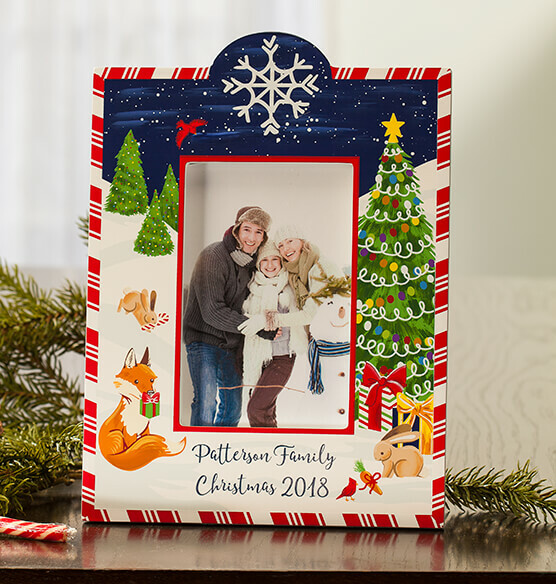 You may customize this whimsical frame with "Christmas 2018", a custom message or no personalization at all. It makes a perfect gift idea for anyone who enjoys displaying photos. Tradition - I get one every year. i need 1993 and 1994, would you have any old stock? I have been collecting these Christmas frames since 2004. They are beautiful and a great way to display my wonderful family Christmas memories. I’ve been buying these frames every year for last 16 years! Love them!!!!!! I have all the years! Love them! I have been ordering these frames for 17 years, since my children were babies. i get one every year. Beautiful, well made, high quality frames! I've bought these for years. Be sure you add the personalization if you want it to say Christmas and the year. This is the first year it's not automatic. It's included in the price, but will be blank if not specified. Our family has collected these frames since 2006. Each frame holds a dear memory from the year, and we love displaying them each holiday season. To capture my memories. I’ve bought this frame for 20 years now! I purchase them every year. It's very cute and great way to collect family pictures over the years. Tradition frames for the past twenty years! Get one every year. Sometimes they are not as good as other years but we love the tradition! I have bought these frames every year for my boys pictures with Santa; I love them and they look great displayed throughout my home. I have been collecting these frames since 1996. Wonderful way to decorate using all of the pictures taken from years back and framed in these delightful frames. I've ordered these frames for 16 years. I have one for every year we have been married. We have these dated back to 1999. It’s tradition! And the hand painted frames are beautiful and add fun Christmas decor to our living room. What is the difference in landscape and portrait? BEST ANSWER: Thank you for your question. The photo is displayed in portrait as taller than it is wide. The photo is displayed in landscape as wider than it is tall. We hope this information will be of help to you. Does the “no personalization” option include the Christmas 2018? BEST ANSWER: Thank you for your question.The No personalization will have no personalization on it. It does not include Christmas 2018. We hope this information will be of help to you. On the "Personalized Winter Frolic Christmas Frame" I only want to add the Family name with Merry Christmas below. Is this "Add A Line for Free" or is this considered 2 custom lines? BEST ANSWER: Thank you for your question. If you want two lines you will need to select 2 custom lines. We hope this information will be of help to you. I need the Vertical frame. How do I order that? You list Landscape or Portrait. BEST ANSWER: Thank you for your question. You would pick portrait. We hope this information will be of help to you.